2019 Toyota Tacoma TRD Pro Leaves limits in its dust. Designed by the gurus at Toyota Racing Development (TRD), the 2019 Toyota Tacoma TRD Pro is built to take on the world’s gnarliest terrain. The stuff you want — like a TRD-tuned suspension with 2.5-in. FOX®42 Internal Bypass shocks, a ¼-in.-thick aluminum skid plate and Rigid Industries® fog lights — all come standard. A mandrel-bent TRD exhaust and available TRD Pro Desert Air Intake51 help optimize engine performance too. It’s the same proven capability that’s helped the TRD Pro Series deliver its unique brand of fun everywhere from the scorching desert to the Arctic Circle, and it’s ready for your next big adventure. Things are about to get a lot more epic. Let’s get dirty. 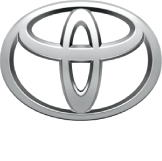 Toyota Racing Development (TRD) is Toyota’s factory-backed racing division. While TRD USA has been building go-fast parts for Toyotas since 1979, our racing legacy traces back well over two decades before that. With a history rich in motorsports, TRD engineers have continued to apply their knowledge to help enthusiasts get more performance from their vehicles, while maintaining factory levels of quality and reliability. 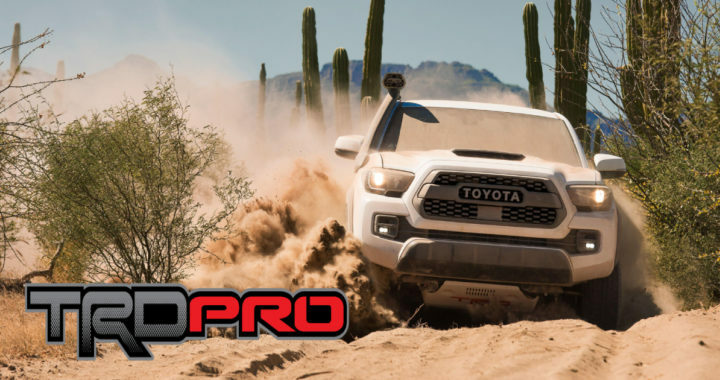 Our TRD Pro Series vehicles are factory-tuned and built to take you way off-road.50 No off-the-shelf components here; our engineers spend countless hours designing, testing and tuning with passion. And with capability this exciting, they will help fuel your passion too. TRD PRO SERIES SKID PLATE See the PDF Pictures HERE! A unique TRD Pro skid plate comes standard on Tacoma TRD Pro. Constructed from ¼-in.-thick aluminum, this piece of armor helps protect crucial mechanical components underneath the front end, so you can even go beyond points on the map. You know your Tacoma is supremely capable right out of the box. But when you want to crank up the attitude, turn to those who know your truck best. Toyota Racing Development (TRD) brings you a line of accessories engineered just for your Tacoma. Each and every part is designed to give you maximum performance with proven dependability. And it’s all available from your local Toyota dealer. All you have to do is pick out which parts are right for you. The interior features unique TRD Pro floor mats16 and a leather-wrapped shifter with a TRD shift knob. With its red contrast stitching, embossed TRD logo and bright chrome accent ring, taking control never looked — or felt — so good. Hard-core comfort. Heated, leather-trimmed seats help keep you warm when you’re charging through the snowy wilderness. And with TRD Pro logos embossed on the headrests, this truck’s interior is the most stylish cabin on the mountain. The bark to match the powerful V6 bite. This cat-back exhaust is constructed from 304 stainless steel, and its precise CNC mandrel bends help maximize efficiency. Helping finish off the package is a chrome-plated, dual-walled tip with embossed TRD logo. FOX® INTERNAL BYPASS SHOCKS TUNED BY TRD See the PDF Pictures HERE! This is extreme engineering. FOX® Internal Bypass shocks tuned by TRD give you the ultimate in performance and control. Featuring 2.5-in. aluminum housings; hardened, oversize shock shafts; a raised front ride height; and remote reservoirs in the rear; this suspension helps knock the edge off the rough stuff. These intense LED fog lights pack a lot of brightness into a compact package. Rugged construction and a wide-angle beam pattern help ensure you have light when, and where, you need it. Breathe easier. Designed by TRD, this snorkel-style air intake places an air inlet high above Tacoma’s windshield. This intake draws cool, fresh air from high above the dustline, helping prevent excess dirt from getting into the engine. New Lifted 2018 Toyota Tundra 4WD Limited CrewMax HERE! Posted in New Vehicles and tagged 2019 Toyota Tacoma TRD Pro Akron Ohio, 2019 Toyota Tacoma TRD Pro for sale, 2019 Toyota Tacoma TRD Pro in Cleveland Ohio, 2019 Toyota Tacoma TRD Pro Northeast Ohio, what is Toyota Racing Development, what is TRD?.